Reproduction in a Mind-blowing Way! The anglerfish would surely not win any beauty contest! However, it is a good candidate for first place in the amazing design category. Here’s why. The female anglerfish has a build in fishing rod attached to her head between her eyes. At the end dangles (in front of her mouth) what appears to be food and fish come by to get lunch. Instead, they are lunch. The anglerfish have huge heads and enormous crescent-shaped mouths filled with sharp, translucent teeth. It’s pretty easy to see how this fish got its name. However, this luring of prey is harder than it seems. There are more than 200 species of anglerfish. Some anglerfish reach a yard long though most are about a foot. They are found in the depths of the Atlantic and Antarctic oceans, as much as a mile below the surface. There is no light that deep in the ocean and ugly doesn’t matter there. But herein is the problem: how does the prey see her lure? The tip of the angler’s fishing pole contains bioluminescent bacteria, meaning they glow in the dark much like the flashlight fish we discussed in an earlier article. A compound called Luciferin (same one found in fireflies) is oxidized by an enzyme called Luciferase. The reaction produces cold light. Thus, in the dark of the ocean, a naïve fish sees the glowing object and comes to investigate. Suddenly, the giant mouth closes on the hapless victim and lunch is served. The darkness produces another problem. When it is time for reproduction, how will the female find a male to fertilize her eggs? The anglerfish eggs are buoyant and form a jellylike mass on the surface. From the eggs, both male and female anglerfish hatch and grow up near the surface. When they are mature, the male stops being able to digest food. He then smells out a female and “will bite into her skin, releasing an enzyme that digests the skin of his mouth and her body, fusing the pair down to the blood-vessel level.” The male deteriorates into only the organs containing sperm. The female lacks a swim bladder so sinks to the bottom to live and eventually to ‘lay’ her eggs, fertilized by the sperm she carries with her from the male. There is little point in attempting logical argument to justify religion. Either take a spiritual line or give up. Your arguments over evolution are so banal as to be not worth responding to. Both creation and evolution are matters of faith since neither can be observed or experimented on. If you choose to accept evolution, you are certainly free to do so, but at least be honest and state you are trusting what you have been taught to be true. It cannot be proven. The point of the articles is not to prove design but to show that the design model answers problems evolutionists cannot explain. In a court, when a mass of evidence is presented in favor of one side, unanswered by the other, is it not logical to chose that side as the correct one? That evolution can explain these things is inconsequential. It does not explain these things, but that does not mean that it can not account for these things. so yes, maybe Jesus created Anglerfish with his very hand. I for one, am descended directly from platypus. Your comment about good scientists presupposes that they do not have an agenda. I quote from an earlier article, Why NOT believe in Creation (2): “Scientists, like others, sometimes tell deliberate lies because they believe that small lies can serve big truths.” (Richard Lewontin) This quote is from Aldous Huxley in an article entitled, “Confession of a Professed Atheist.” Notice how transparent he is here. “I had motives for not wanting the world to have meaning; consequently assumed it had none, and was able without any difficulty to find satisfying reasons for this assumption . . . For myself, as no doubt for most of my contemporaries, the philosophy of meaninglessness was essentially an instrument of liberation. The liberation we desired was simultaneously liberation from a certain political and economic system and liberation from a certain system of morality. We objected to the morality because it interfered with our sexual freedom.” Is that the kind of scientific openness you are speaking of? scientist is not synonymous with atheist. there is no church or fundamental hierarchy of the beliefs of atheism, if there was, it would by definition not be atheism. saying one atheist speaks for all atheists is kinda like pulling out a quote of a self professed witch who said, i want to cast a spell on everybody and kill them, and then assuming that everybody who believes in anything wants to kill everybody (extreme example). A scientist with an agenda is a bad scientist. yes there are some bad scientists, but scientists that derive their science from mathematical ideas, and philosophical mathematical theory and proof theory and language theory are very trustworthy. If you disbelieve anything they say, take some courses in modular logic, read their papers, and find the flaws in their arguments. A good person should never give up morality, he should just derive his own morals (ethics) from the axioms of good human behavior- everybody should have a fair chance at life, happiness, and to do whatever they want- allowing everybody to do whatever they want reduces the things you as a person can do, and with everybody acting that way you can get moral laws and ethics. Allowing people to do what they want turns into forcing yourself to behave well. 1) Of course no spokesman speaks for atheism or for all Christianity for that matter, but you must admit that Aldous Huxley was a leading spokesman for evolution, and his opinion was, ‘For myself, as no doubt for most of my contemporaries. . .’ as he stated in the quote. 2) I admire your faith in the open mindedness of scientists, but I must feel you are a bit naive about their unbiased views of research. I found this article from Nature magazine, 435 pp. 718-719, very interesting. A survey was taken to see how honest researchers were with their data. “Of 3,247 early- and mid-career- researchers who responded, less than 1.5% admitted to falsification or plagiarism, the most serious types of misconduct listed. But 15.5% said they and changed the design, methodology or results of a study in response to pressure from a funding source; 12.5% admitted overlooking others’ use of flawed data; and 7.6% said they had circumvented minor aspects of requirements regarding the use of human subjects.” In other words, money can affect the ‘open mindedness’ of one out of three researchers asked. Does it not seem strange to you how emotional scientists can be in discussing creation? We can discuss Shakespeare, or even world religions without getting heated up. Why is it that teachers have great latitude to teach just about anything, except in the area of origins. Plenty of evidence indicates teachers and profs have lost their jobs for suggesting Darwinism might not have all the answers. Emotion is certainly not based on unbiased facts. It seems to me it indicates the possible presence of guilt. And don’t you think if they thought their job was on the line, they were dismiss any doubts presented? I am glad you are thinking these things through as I have. In light of this open mindedness you expressed, I wonder if you have considered the logic of creation scientists like those from ICR or Creation Moments? So as not to be accused of hypocrisy, I challenge you to do so. 1) That Aldous Huxley supported and spoke for evolutionary theories should be inconsequential. Do you stop believing in god because Hitler/arbitrary evil person believed in god? Never the less, Aldous Huxley was not a scientist, he was a writer, a good writer, and a fairly creepy writer, but not an expert on scientific method. That evolution is “true” has been shown by scientific people who attempt to minimize the amount of unproved fact in their papers. 1.5% of people who have falsified data is a really small number. it is roughly consistent with the % of the adult population of america that is currently in jail (2.4% according to Wikipedia, so technically fewer- the # of scientists who have ). There exists an evil unmoral population in any statistic. “15.5% said they and changed the design, methodology or results of a study in response to pressure from a funding source.” That is understandable- it is hard to build a 2 billion dollar particle accelerator when you have 1 million. When an honest scientist (as we have previously seen, honest is roughly about 97.6%), modifies the experiment, they write the paper using the methodologies that have been altered, and usually add something in the conclusion about how they would have liked more money to do a more thorough experiment, and leave the thoroughness for somebody else to do. Big experiments are usually reproduced many many times before scientists accept the results, so many times that they are often reproduced in high schools. To alter the result of a study is dishonest, but then the question is vague and equivalent to the previous question about falsifying data. By probability, you can not definitely know the percentage of reports that have been falsified for money that have also been falsified, but if you assume independence of conditions, it might be around .2% of the total # of scientific papers. “12.5% admitted overlooking others’ use of flawed data” Still a small percentage. That means that 87.5% have never overlooked flawed data. If they had overlooked flawed data, it was likely because the flawed data was not integral to the argument they were trying to make, it was some other aspect of the paper that they were using. Honestly, I’m not a huge fan of this study. Better data from this study probably exists unpublished, and they should probably publish it somewhere. Modified methodology and design because of money and also falsified data. An even better study would go out and investigate personally scientists and their papers and answer these questions without the possibly flawed opinions of the scientists being questioned. This study however is by definition the scientific method. Every study is repeated and repeated, until, eventually, at the infinite experiment, the experiments tend to be 100% towards conclusion x. Because we don’t have the luxury of being their at infinity to see what x is, scientists have a tendency to use basic ideas to extrapolate on the trends of current experiments, and say that the current trend is definitely correct. Scientists are not mathematicians, logicians, or philosophers after all. One of the beauties of the scientific method is this repetition, after a certain amount of steps, not circularly dependent, the scientific method weeds out the falsifications and requirements on money. It does not seem strange to me in fact. If you spend your whole life studying Taoist origins in Asia, and somebody at random comes up to you, with no previous experience in the subject, and then tells you, without any proof or logic, that Taoism originated in south america, because he once met a Taoist in South America, I can guarantee you that after an hour or two, the world religions expert would become very emotion. Evolution is the same thing, except that there is a very massive group of people out there, who without ever reading all the papers of the scientists, have decided that evolution is completely false after generating a few often flawed counterexamples. It becomes very aggravating to try to explain something both logical and scientific to somebody who has dismissed your logic as immoral, not illogical. The fundamental reason scientists reject creationism as a valid argument is because of it’s single major logical flaw. Creationism assumes the existence of god, and the legitimacy of the bible. This is not to say that scientists do not believe in god personally, and do not believe in the bible personally. In order to be scientifically rigorous, a scientist can, and should, dispose of everything that he can not prove to himself directly, or logically. This does not mean that a scientist has to prove everything to himself, but he should know that if he has to, he can. God is by definition of unprovability for a scientist. He will not reveal himself simply because you ask, and there exist no reproducible way to obtain direct evidence of his existence. To be fair, I am not being hypocritical, I have not read pages and pages of evolution texts, I have only seen a few well thought out logical arguments, whereas I’ve seen mountains of creationism arguments, and all of them seem to have the same basic structure of pointing out a single counterexample to evolution, and saying it can not be evolution because it is so unique, it must be created by god. I do not have time to sift through pages of the same stuff, and I can imagine you do not either. That is why in an argument, you present your argument, or somebody else’s, in your own words, then cite the source you got it from. You do not refer somebody to another source. In order to disprove evolution, you need to examine the arguments on a microscopic scale, and disprove, logically, without the assumption of god, or without anything but what evolution assumes. In order to simply find evolution flawed, you need to go and find a microscopic flaw in one of the logical derivations of evolution. The evolution theory simply states “There exist creatures which it is likely mutated selectively from other creatures.” It comes from the basic assumption that the world as we see it exists, and follows the axioms of logic. In order to disprove it you would need to say “No creatures appeared through selective mutation.” or “for all creatures x, and for all ways for x to be selectively mutated into existence y, y can not possibly generate x.” Evolution makes other, finer claims, but this is what is required to disprove all of evolution. Furthermore, in a world where the status of the existence of god is unknown, and can possibly not be known/proven, what would it take for you to accept the legitimacy proof of evolution? Remember, god is not an inherent part of the theory of evolution, so it should not be necessary for god to inform you of the legitimacy of evolution. If your answer, other than god declaring that is how it was, is nothing, or something clearly illogical, then you should not be arguing for or against evolution because you are clearly not following set the rules of a sound debate for the betterment of the human kind. For creation to have been proved to me scientifically, god would have to address me personally and tell me of it’s legitimacy. This is valid as god is a fundamental aspect of the theory of creation, and because, by definition, god would be omnipotent and all good. Note: I do not recall anywhere saying or defining god as also always telling the truth. It could be the case that god lies for the good of the people. If this is a case, then evolution may be true or not, and it would take more to convince me of creation. Thus, also in my instance, god would also have to prove himself both god, and all truthful. This is probably much more difficult for him to do, because as stated in philosophical literature, anything that god does to prove himself might cause him to be violating his all goodness. Thus god might not be able to officially prove himself to man. However for me, it would probably be sufficient for him to move a mountain without hurting anybody or something like that, where I nor anybody else could figure out any other possible explanation. Forgive me, but your comment brought to mind another quote, this time from Prof. Will Provine, an outspoken atheist. “Belief in modern evolution makes atheists of people. One can have a religious view that is compatible with evolution only if that religious view is indistinguishable from atheism.” I agree with this. Either God was involved in the creation of the world, or it is totally the result of random accidents. The point of these articles, and of a majority of creation research, is that random accidents cannot possibly explain the complexity and interrelationship of life that we have on earth today. With all the experiments in controlled environments that have gone on over the decades, if evolution could take place at all, surely someone would have been able to force it into happening by now! By this of course I mean macroevolution, changing one species into another, permanently and able to reproduce itself. Are evolutionists honest in admitting they have not done this, even once? Why is it that Creation has to prove itself, but not evolution? As stated earlier, neither is reproduceable, and therefore the subject of origins is really not in the realm of science at all. In this sense both views are extrapolations of the data available. As for God demonstrating His presence, it is very possible He is doing so and has done so and you are looking for the wrong thing or in the wrong place. Try this: say, ‘God, if you are there, show yourself to me, any way you choose. To the best of my ability I will be open to your proving yourself to me.’ If you really mean it, God will not only show you Himself, but He will make known to you that He loved you so much that He sent His Son into the world to die for your sins so that you could be with Him forever. (John 3:16) But you must honestly seek Him. In the book of John in the Bible we are told of people who watched Jesus raise a man from the dead, then went and reported it as troubling news. I pray you will not harden your heart against Him as they did. Evolution is not comprised of random accidents. This is the fundamental misunderstanding of the theory that most creationists seem to have. In evolution, there are no accidents, there are no sudden mutations from species to species. The theory is much more elegant than that. What happens is, there exists a population. Within that population exists sub population X and X’ with two separate attributes, for example, the population of people with sickle cell anemia and without sickle cell anemia. In a certain location, the attributes of population X allow population X to survive longer than population X’, and thus population X’ slowly dies out. This is analogous to how in certain developing countries, people with sickle cell anemia have an advantage over those without it in that they can not get malaria, and thus there exist more people with the condition. In other countries without malaria, these people die younger. Now, evolution in itself has not suggested that the end all appearance of these sub populations is through random accidents, it has states that it could have been through genetic mutation from ultra violet and high frequency radiation, but this has not been proven. It could be that a deity is controlling the populations that appear. Another good example is the flu shot. Every year you have to get another one. This is not some conspiracy, if you stop getting the flu shot I can assure you that at some point you will get sick again. This is because on a yearly basis, the flu, which is highly mutable, evolves to better attack your system. Now, I’m wondering, why you think I’m an atheist, and why you are so rude and insulting as to brand all evolutionists as atheists. Surly you would not appreciate me branding all creationists as nazis. Just because the bible, which is not the word of god (but contains possible misquotes of god), talks about the world doesn’t make it correct. Ultimately, these misunderstandings arise from the misconception that science is a view on life taken by the scientist to be true. This is not true. Science by definition is a algorithm taking advantage of non belief in order to expose a new idea. It doesn’t make claims to the absolute truth, and thus allows the scientist to believe in whatever he wants when he goes home and takes off his lab coat. Science is the study of the world as we see it as most plainly and simply as possible, whereas Theism is the study of the world as the bible, or our minds, describe it. The two are fundamentally incompatible ideologies. You can not say that creationism is wrong, or evolution is wrong, but you can say that creationism is scientifically wrong, and evolution is wrong to the Christian bible. As for the reproducibility of evolution, it need not be reproducible completely. Science doesn’t expect that a system be reproducible, just the results of an experiment. I should think that the flu shot works year after year (not to mention the success scientists have had breeding new species of fish) should be a reproducible enough experiment. Ultimately this is the problem with asking god to show himself in any way he sees fit. If he could show himself by way making the gravity cubes ignite in front of me, and then doing it whenever I asked again (and anybody else), then I would definitely scientifically accept god. But alas, the nature of that response denies responsibility for reproducibility. Indeed, some evolutions admit that mutation is the only way to explain the mechanism of macroevolution. At least, this is the only mechanism we know of that could explain a change in species from, say, reptile to bird. Yet mutations are always or almost always detrimental, as you know. Even if any are advantageous, it would be like taking 10 steps back and one step forward. That is not progress! You misunderstand the quote I agreed with. The atheist quoted stated that, if someone had a different theology, it would have to be virtually identical with that of an atheist. Now that’s an amazing absolute statement for someone so rigid about true science. Since the Bible claims to be the Word of God, and demonstrates itself to be superior to any other writing, the burden of proof is in your camp. Merely making such a definite statement certainly doesn’t make it true. But for him to go home and deny what he discovered with his lab coat on is fundamentally dishonest. We part ways on this statement as well. You are implying that science sees things as they are while theology seems things subjectively. Yet, you state that science is constantly changing. How can it be as things are and yet keep contradicting itself? And that evolution ignores fundamental laws like the 2nd law of thermodynamics and, if you are speaking of macroevolution, is therefore not even good science. microevolution works the same way as macroevolution. Macroevolution takes much longer, by definition of macro. You simply can not accept micro without accepting macro, and you can not accept macro without accepting micro. The mechanism of change in both is the same. Chromosomes can be transfered with mutations, extra copies, missing copies. There are a number of human disorders involving these problems. Part of the reason different species have different numbers of chromosomes is that chromosomes do dictate the ability of a species to breed together. If a species X moves to a new location, and addapts to that new location, there is a chance a certain percentage (given many many years) looses or gains a chromosome in such a way that they are still able to exist and becomes a separate breeding selection. when the original species and the new population are brought back together, perhaps by a land bridge appearing again, the selection of the new population that did not change chromosome number will breed with the old species X, and the new children will become vastly different from those previously adapted other species with a different number of chromosomes. the other species with a different number of chromosomes will stop attempting to breed with the original species, being vastly different, and will form a new species altogether. a reptile does not change into a bird. a climbing reptile discoveries the ability to jump from tree to tree is very convenient, the population of better jumpers survive. land masses separate, the better jumpers mutate by the process above, forming gliding reptiles. Gliding reptiles turn into reptiles with winged arms, which gain feathers for aerodynamic efficiency, and when living food becomes scarce from lack of land dwelling prey, they form beaks to break open seeds when green vegetation is not as abundant from lack of sunlight. The process continues till you get birds with different numbers of chromosomes. Right, because if you believe evolution works, you can not believe in an omnipotent, all powerful, all good being, or many such beings. that no current religion incorporates evolution does not mean future religions will incorporate evolution. Dune was a very very good book. I do not believe in the “spice” or witches. That something is a well written source with many facts in it does not make all facts in it true. A fact is scientifically true if it can be experimentally verified. When scientific papers introduce “facts”, they introduce them along with methods that they might be verified with, with the expectation that people will then go attempt to verify the facts. So far nobody has made an attempt to verify that any of the quotes of god in the bible were actual quotes. The quotes are generally matters of opinion which means that they are neither logically true or logically false, so their content can not generally be evaluated as such. If the content can be evaluated as true, there is no guarantee that the claimed person did in fact say it. When I say possible misquotes, it is possible that god did say those things, but it is also possible that god did not. Because of the nature of the document, printed and reprinted, it can not be scientifically verified. Furthermore, that the quotes in the bible are true is scientifically irrelevant. Science is concerned with the truth of the content of the statement, and not the statement. I’m not proving the bible is factual or not factual, I’m just saying you can’t prove it completely factual, but I can show a part of it non factual. Ultimately, god did not write the bible, the apostles did, and whoever last published your copy of the bible wrote that copy. Thus, anything in your copy of the bible is a quote. If you have ever played the game telephone, then you can see why some might be skeptical that the bible contains exactly what it contained when it was first written. Thus the claim is true. QED. I fail to see the point in that statement. If he is being dishonest, why would attempting an experiment be more dishonest then saying, nothing he did that day was true, this is all a dream. That he makes any statement as to the nature of reality is in a way dishonest, but why is the statement concluded after examining his reality more closely more dishonest than simply saying his reality is equivalent to a shoe. Science does not contradict itself. As something new in science is seen, the old view is discarded for the new view. This is not the same as science making the claim that both views are true at the same time. The newest and most widely accepted view is the truest view. Science takes the information currently available, and defines a model to explain the information and allow verifiable claims to be made. The model is only mathematically correct when every possible claim has been verified, and all possible information has been gathered. But these models do exist to conform to all the information possible that has been gathered. Science does not assume the truth of the claim, it assumes the truth of the information. If a ball drops, and you decide F=MA, you do not assume F=MA is true for everything, but you do assume that the ball did drop and the world is not the matrix. If the world was the matrix, and you assumed so, you would get nowhere, and human progress would end. Evolution does not ignore the second law of thermodynamics. A better formulation of the second law implies: In a system, a process that occurs will tend to increase the total entropy of the universe. This implies that a process can decrease the entropy of its own system iff it increases the entropy of the universe by a greater factor. Ultimately, evolution tends to increase the entropy of the universe by increasing the number of species. The more species there are given a constant amount of biomass, the more randomly everything is arranged, and the higher the entropy of the system. That evolution makes more complex organized creatures from simple unorganized creatures is not a correct statement, and even not really related to the subject matter behind the principles of the second law of thermodynamics. If everything were single celled amoeba, the entropy would be very very low. If there were trillions of types of randomly celled organisms, each with only a few randomly located copies thought the system, the entropy would be rather high. Everything existing separately in chunks of carbon, aluminum, and water also corresponds to a low entropy. No one tried to explain how the anglerfish evolved. I’m going to agree with Robert Z. Will the evolutionist please step forward with an explanation of how the fish evolved the lure. I’ve searched from Google and can’t find ONE answer. I guess it was really hungry one day and just really wanted one. Mabey it started off as a small little bump. And as natural selection tells us it kept forming because it helped it survive. I agree. I havent seen any explanation of how the anglerfish could have evolved to the point where it now acquires an artificial light. Same with fireflies. According to evolution, how would that have happened exactly? If there is not a designer, then the creatures must have miracolously designed themselves according to their own wills. I’m not a biologist or anything, I am a layman, but instances like these, in my opinion, make the evolutionists look pathetic trying to explain all life using their ‘natural selection’ theory. Evolutionists call me delusional, and I refer to them the same way. I personally think this article only begins to touch on the problems the angler fish poses to evoluiton. But specifically it highlighst the untenable faith involved!!! 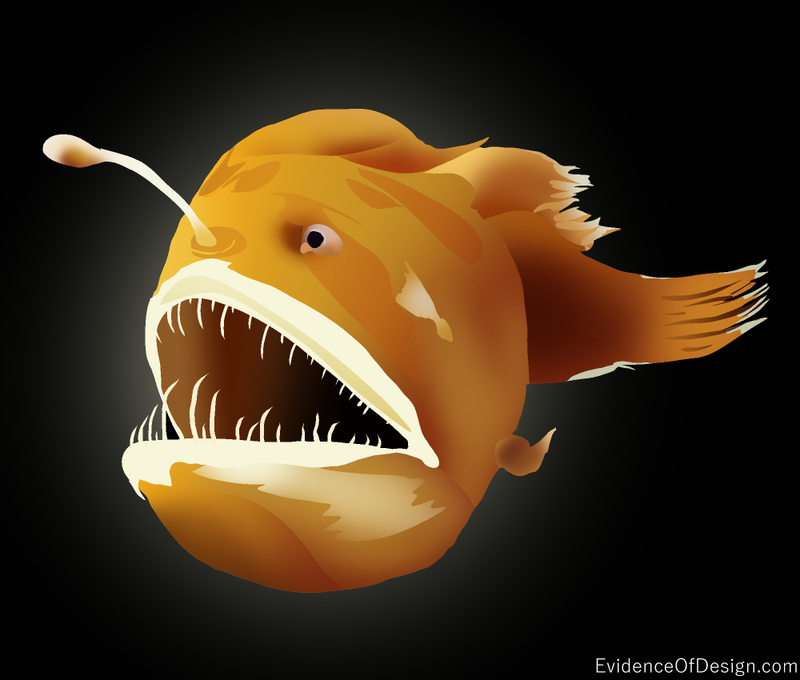 imagine the first angler fish male who must seek out a female. when he is mature he loses the ability to digest food, he must seek out a female to attach to!! SOOO…when he encounters her if he cannot(by evolutions blind change) produce the particular enzyme to bidn to her by breaking down his and her skin…then its over, the species is extinct becuase he cannnot eat!! btu we can aslo infer that to say evolutiosn mechanisms did this is both an argument form incredulity and so implausible as to be impossible..this kind of co evoluiion claim is waht destroys the whole theory! Evolution is a religion, I am not religious. I love microbiology and many people have tried to use microbiology as “some what of kind of example of how evolution some what works” but evolution is much deeper than a few (or a billion as for microbiology) mutations that allow a single celled organism to adapt to it’s environment. If you’re scientific at all you’ll know that this does not prove anything aside from the fact that a single celled organism can adapt and “evolve” as many times as it wants but will still remain a single celled organism … which also has not “evolved” into a different species of entirely different genetic material, but yet remains the same species. An E coli bacteria is still an E coli bacteria no matter how many times it has “evolved”. Further more evolution is stated as a “theory” AND a scientific “fact” so congrats evolutionists. But a scientific fact is entirely different from an ABSOLUTE fact for those who try to use this to “prove” evolution to be true. An absolute fact would be 1+1=2. Evolution has too many holes and disfigurements for it to be an absolute fact, so it can be dis-proven, whether big headed evolutionists will admit it or not … which in the same sense is the same as those who practice religion. Therefore, as I above stated, evolution is a religion – and I am not religious. Your unbiased view is very interesting. But I would like to hear exactly how you propose microbiological animals and the world was created? If you don’t believe Evolution or Creation is the right answer, what is? You do bring up a good point. This is all about God. You either believe there’s a God who made everything, or you believe in the earth as a god. One who creates its own life over long periods of time. Read a book, a real one, it doesn’t hurt. Another issue with using this example to try and debunk evolution is that this fish is simply too horrific a thing to have been deliberately created by a loving God. There was a man living in the 1800’s named the “Elephant Man”. I would invite you to look him up. God used a horrific looking man from a state of thinking of suicide, to meeting the queen of England. Surely God uses even the least pleasant of His creation to bring glory to Himself.